Big-boat yacht racing is one of the only able bodied sporting activities where standing arm-cranking (‘grinding’) is the primary physical activity. However, the physiological capabilities of elite sailors for standing arm-cranking have been largely unreported. 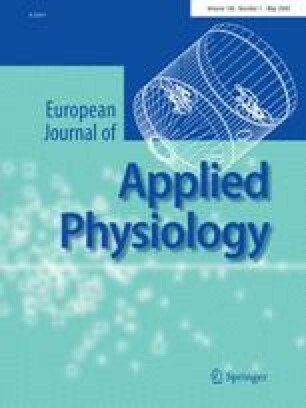 The purpose of the study was to assess aerobic parameters, VO2peak and onset of blood lactate (OBLA), and anaerobic performance, torque–crank velocity and power–crank velocity relationships and therefore peak power (P max) and optimum crank-velocity (ωopt), of America’s Cup sailors during standing arm-cranking. Thirty-three elite professional sailors performed a step test to exhaustion, and a subset of ten grinders performed maximal 7 s isokinetic sprints at different crank velocities, using a standing arm-crank ergometer. VO2peak was 4.7 ± 0.5 L/min (range 3.6–5.5 L/min) at a power output of 332 ± 44 W (range 235–425 W). OBLA occurred at a power output of 202 ± 31 W (61% of Wmax) and VO2 of 3.3 ± 0.4 L/min (71% of VO2peak). The torque–crank velocity relationship was linear for all participants (r = 0.9 ± 0.1). P max was 1,420 ± 37 W (range 1,192–1,617 W), and ωopt was 125 ± 6 rpm. These data are among the highest upper-body anaerobic and aerobic power values reported. The unique nature of these athletes, with their high fat-free mass and specific selection and training for standing arm cranking, likely accounts for the high values. The influence of crank velocity on peak power implies that power production during on-board ‘grinding’ may be optimised through the use of appropriate gear-ratios and the development of efficient gear change mechanisms. We are grateful to Dr. Cristina Pérez Encinas and Dr. Luis del Moral Garcia for their assistance with the data collection, and to Dr. Massimo Massarini for his contributions to the study protocol.